Where will Thomas end up? Let us know! Not highly recruited out of high school, Tyrus Thomas made a name for himself as a freshman at LSU, averaging 12.3 points on nearly 61% shooting, 9.2 boards and 3.1 blocks. The 6-foot-9 jumping jack scored 21 points and grabbed 13 boards to fuel the Tigers past Texas and in to the Final Four, one of many performances that helped him earn the MVP of the NCAA Atlanta regional. Thomas, at just 19, has drawn many comparisons to former LSU product Stromile Swift but seems to have much greater passion while playing the game than the current Rocket. Tremendous potential with athleticism to spare. Gets off the floor quickly with great leaping ability (over 40-inch vertical). Great wingspan that he uses to his advantage with excellent shot blocking skills and very good rebounding. Good speed and runs the floor very well. Decent touch on his shot around the basket. Energetic and passionate during games. While very athletic, Thomas is still young and raw and needs to add bulk to go up against polished NBA power forwards. Poor range on his jump shot - will have to improve in this area. The big question: Is he serious about the game and improving every night/year? It's what separates the Amares from the 'Stros. 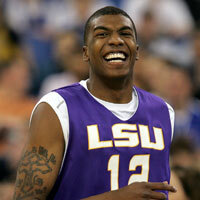 Tyrus Thomas on the Houston Rockets? 6-foot-9 super leaper out of LSU? Sounds like Rocket fans have gone down this road. No, the book is not yet written on Stromile Swift, but his first 6 seasons in the league have not come close to what many thought his potential was. Will the case be the same for Tyrus Thomas? As tempting as it looks to say this is "Stro Part Deux", Thomas has a motor and a passion for the game that appears to be missing in Swift. I think Stro was one firecracker with a dud fuse, while Thomas has a legitimate chance at an explosion. If he falls to #8 you have to take him. With that said, I think the Rockets have to hope to get more out of Swift and try to find a one, two or three in this draft.